10.) Which team has more momentum? The New York Giants have won five games in a row, including their final two regular season games just to get a playoff berth. After dominating the Atlanta Falcons in the first round of the playoffs, the Giants took down the top two seeds in the NFC, on the road, in consecutive weeks. The New England Patriots have won an impressive 10 games in a row. In the playoffs, they have taken care of the pesky Tim Tebow and the Denver Broncos as well as the very tough Baltimore Ravens. 9.) Will Madonna justify her halftime show selection? Okay, I couldn’t think of 10 football related questions, so I cheated a bit. Madonna was an interesting choice for the halftime show this year. While she is arguably one of the most successful and popular musicians of the last 30 years, she isn’t the first person I’d think of to entertain football fans. Regardless, the halftime show is generally overlooked, and I’m sure Madonna can’t be any worse than the Black Eyed Peas were last year. Prediction: First song–“Like a Prayer?” I really have no idea. 8.) Which break out player will have a bigger game, Victor Cruz or Rob Gronkowski? It’s hard to argue which player has been more influential to his team’s success this year. Rob Gronkowski exploded for 90 receptions, 1327 yards and found the end zone 17 times, which set a record for the most touchdown catches by a tight end in a single season. “Gronk” has become one of Tom Brady’s favorite weapons and takes some pressure off of star wide receiver Wes Welker. The Giants defense is pretty strong, which they showed two weeks ago against the 49ers. But both touchdowns they allowed were scored by tight end Vernon Davis. Victor Cruz came out of nowhere this year to haul in 82 receptions for over 1500 yards and added nine touchdowns. Cruz’s emergence, along with Hakeem Nicks’ steady improvement, has vaulted the Giants receiving core to one of the best in the league. Given that the Patriots’ secondary is by far their biggest weakness, Cruz should factor in big come Super Bowl Sunday. Prediction: Pats’ head coach Bill Belichick is a defensive guru and will have two weeks to plan how to stop Cruz. But the Patriots secondary is just too weak. Also, factor in that Gronkowski hurt his ankle in the AFC Championship Game and probably won’t be 100% physically if he even plays. Cruz will have the better day, although both players will find the end zone. Lucas Oil Stadium. 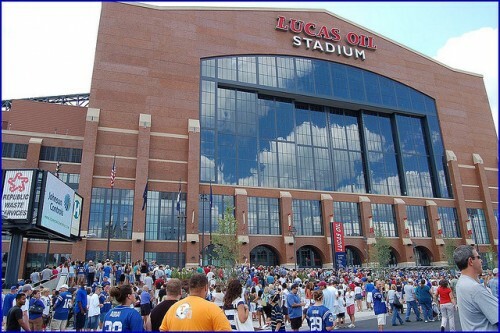 Home of the NFL’s Indianapolis Colts, and home of Super Bowl XLVI. Photo Credit: Just_Bryan, CC BY-ND 2.0. 7.) Will Eli surpass Peyton as the best Manning QB if he wins? This is the storyline that everybody wants to talk about. Peyton has a pretty impressive resume, including four MVP awards, 11 straight Pro Bowl selections, five first team All-Pro selections, and a 141-67 regular season record. Eli hasn’t won an MVP, has not received a first team All-Pro selection, and has made it to only two Pro Bowls. Eli has a long way to go to be considered as good overall as Peyton. But when it comes to the playoffs, the picture begins to change. Peyton is just 9-10 in the postseason whereas Eli is 7-3. Plus, each Manning brother has one Super Bowl title. If Eli is able to win another Super Bowl, the distance between him and his older brother will get significantly smaller. 6.) Boston vs. New York: Which is the better sports city? New York may be the greatest city in the world, but Boston is arguably becoming the sports capital of the world. Since the year 2000, New York teams have won just three titles (Yankees in 2000 & 2009, Giants in 2007). Boston on the other hand has a whopping seven championships in that time frame (Patriots in 2001, 2003 & 2004. Red Sox in 2004 & 2007. Celtics in 2008. Bruins in 2011). If the Patriots win, Boston will cement its status as the new title town. If the Giants hoist the Lombardy trophy, they’ll close the gap and keep the debate going into the future. 5.) Which hated coach will be better? According to a Sporting News poll from earlier this year, Tom Coughlin was the coach that the 111 surveyed players least wanted to play for. Bill Belichick was number three on the list, but has since moved up to the number two spot following the firing of Tony Sparano. While both of these coaches may not be liked by their players all that much, they certainly know how to get the job done. Belichick has three Super Bowl rings, while Coughlin also has a Super Bowl title to his name. Prediction: It’s hard to judge this one. But based on game planning, in-game adjustments, and coach’s challenges, I’m going to say that Bill Belichick will prove to be the better coach on Sunday, while Tom Coughlin will have the better sideline scowl. 4.) Will Brady become the best QB of all time with a win? Joe Montana is widely considered to be the best quarterback of all time. His resume includes four Super Bowl titles, three Super Bowl MVPs, two regular season MVPs and eight Pro Bowl selections. Tom Brady isn’t far behind with three Super Bowl titles, two Super Bowl MVPs, two regular season MVPs and seven Pro Bowl selections. If Brady is able to capture another Super Bowl this year, he’ll basically have reached all of the Montana milestones, and will still have at least a few years to go in his career. Prediction: This will be Brady’s best and possibly his last shot at ring number four. If he gets it, he’ll eventually be remembered as the best quarterback of all time. 3.) How many times will we see the David Tyree catch? Who can forget this ridiculous play from Super Bowl XLII? Down 14-10 with less than two minutes left in the game, Eli Manning was leading the Giants down the field. Facing a crucial third down, Manning avoided several sacks and heaved the ball down field. David Tyree somehow made the catch against his helmet. The acrobatic grab gave the Giants a huge chunk of yards, a fresh set of downs, and put them in position for the go-ahead score. It was one of the most memorable plays in Super Bowl history, and one that haunts Patriots fans to this day. Prediction: The over/under for how many times NBC shows this play on Super Bowl Sunday is at 4. I’m taking the over. 2.) What commercial will be the most talked about? When you pay $3.5 million for a 30-second commercial, it better be a good one. Coca-Cola, E-Trade and Bud Light are the perennial favorites to take home the crown for best commercial. Although last year, Volkswagen snuck away with the title. Prediction: I think Bud Light takes this challenge the most seriously, so I’ll say that they will provide the most memorable 30-second spot. 1.) Will the Patriots get revenge for Super Bowl XLII? Super Bowl XLII was one of the best in recent memory. The 18-0 (including playoffs) Patriots looked unstoppable going into that game. The Giants on the other hand were not given a fighting chance. But the G-men shocked everybody and ruined the Patriots’ perfect season. That game is one of the few blemishes in the nearly perfect career of Tom Brady. I’m a little shocked that the Patriots are three point favorites. The Giants beat the 15-1 Green Bay Packers and the 14-3 San Francisco 49ers in the past two weeks on the road. They beat the Patriots in Foxboro in Week 9. This should be a pretty evenly matched contest. Prediction: While I think the Giants are the better team, I predicted the Patriots would win the Super Bowl in my NFL Preview blog back in September. I can’t stray from that now. Patriots 27 Giants 23.